Eeek! I am so excited its soup season again! I have so many soups I want to share with you. But alas, I will take it slow and spread them out over the long, cold winter to come! The ingredients in this recipe remind me a lot of the Creamy Enchilada Casserole my mom used to make when I was a kid, except it’s SOUP STYLE! The stand out ingredients in this soup are beef broth and steak sauce. They really kick this soup up a notch and will make your guests wonder what you did to get such a rich flavored soup! We feed seven on most nights, Dale and I, Papa Don and four kids. So I doubled it, and I am glad I did, because we barely had a bowl left! 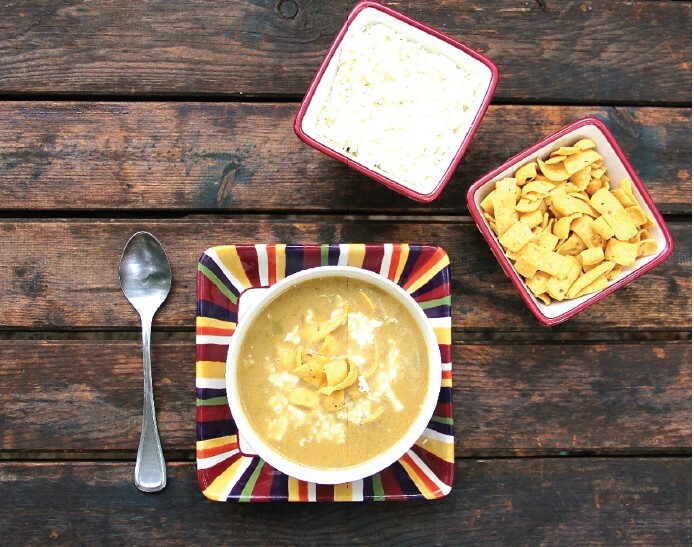 Served with corn chips and freshly grated mozzarella cheese, this soup is sure to make you go weak in the knees. Place chicken breasts in a large saucepan and fill with water, add a few dashes of salt. Boil until chicken is done, about 20 minutes. Drain water and shred breasts with fork. Set aside. In large soup pot, sauté chopped onion and garlic clove, butter. Once the onion softens, add all other ingredients (except garnishes and chicken) and bring to a rolling boil. Turn heat to medium-low and stir in chicken shreds. Simmer 30 minutes to meld flavors. Serve with freshly shredded mozzarella cheese and Fritos corn chips. Tonya is a mid-west Mom of 4. She is a self-proclaimed Ice Cream Aholic and may or may not have 8 half gallons of the “good stuff” in her deep freeze at all times. She is into natural remedies, trying new recipes, limiting TV time to promote reading, “Slow obedience is NO obedience” and making all those little moments count with her family. You can find her blogging at 4 little Fergusons, www.4littlefergusons.wordpress.com or on her facebook page, 4 little Fergusons.